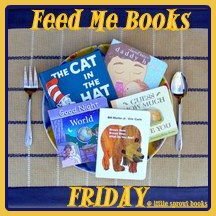 Ready-Set-Read: What is your child reading today? 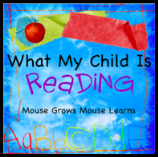 What is your child reading today? Cruising the library shelves last week, we found a couple of interesting books. The first one was this silly, almost wordless picture book. Banana by Ed Vere In this story, two little monkeys learn about sharing and about saying the magic word, "please". While I found this book a little too silly, Logan LOVES it. Maybe it's the illustrations, maybe it's that it only has two words, "Banana" and "Please". I guess he feels confident to read it! For Just One Day by Laura Leuck In this rhyming story, a group of children imagine what it would be like to be a variety of animals for just one day. In the end, the kids decide the thing they most want to be is themselves. Good self-esteem booster. The illustrations are adorable and different. If you check this out, look for the under the sea page. So cute! I also picked up Brown Bear, Brown Bear audio book. It includes a CD with the audio reading by Gwyneth Paltrow. She does an excellent job! It's an interesting new twist to one of our favorites. Currently, this is Tyson's favorite book. Tyson just turned 17 months this weekend and he is in LOVE with animals of all shapes and sizes! So, that's what we are lounging around reading this rainy week. What about you? Have you picked up any great books at the library or elsewhere lately? Please share! I'd love to pass along your great reads. If you want to see what everyone else in the blogosphere is reading, go check out these great link ups. My 4yo is currently in love with my old book: The cow who fell in the canal by Phyllis Krasilovsky. I just googled it to post a link and was gobsmacked to see that the only editions now available are going (used!) for astronomical prices. I did, however, come across this and have, myself fallen in love! It's a really delightful animated version of the story, exactly as written and the pictures are fabulously similar to those of the original book. The music and sound effects are wonderful - you really get the whole atmosphere of the countryside and then of the town. The subtitles are accurate and could be helpful to school children. Jonathan also *really* liked Ed Vere's book. We've also done Brown Bear & Friends and I was also impressed with Gwynneth's readings. I haven't heard of For Just One Day- it sounds like another one J. would love. Thanks for the recommendation! Brown bear is currently one of Roman's favorites too! That along with Mary Had a Little Lamb and Spot Bakes a Cake. My class loved Banana! this year. Lots of great books here. Thanks for sharing.